I love my zucchini hummus. I love my digestive-friendly hummus. I love hummus in wraps, on salads, and served up with veggies for dipping. I love it almost as much as I love my guac, and sometimes more. No matter how you slice or dice it, I’m a hummus fiend. My friend Caroline is a hummus fiend, too. And as it turns out, she’s also a lover of broccoli (in fact, that most beloved of crucifers is nestled snugly in her blog title). Recently, as I was reading Caroline’s blog, I thought, “Hmm. Broccoli+hummus. Broccoli hummus?” Heck, if I could make it out of raw zucchini, then surely I could make it out of broccoli, too? The problem was that I worried about the bitterness of raw broccoli. Dearly though I love that veggie in any shape or form, it tends to pack a spicy (and not always pleasing) bite when we’re lovin’ it in the raw. 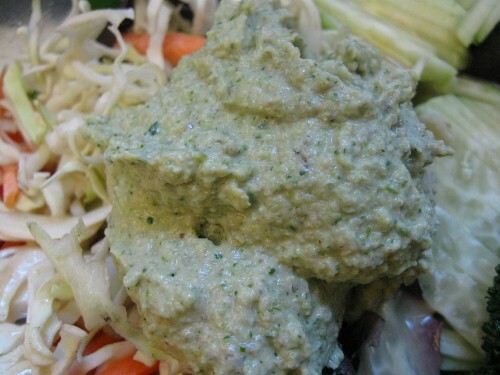 Still, recent experiments with a broccoli-tahini pate had given me encouragement that raw broccoli can, with the right balance of flavors, be perfectly mellow. And so, with Miss Caroline in mind, I set out to concoct a recipe for a raw hummus that’s simple, tasty, and that tempers the bitterness of raw broc. Caroline, this baby’s for you. Place the veggies into your processor and process till finely chopped. Add remaining ingredients, and blend till smooth. This will mean stopping a few times to scrape your bowl! If the mix is too thick — which it may well be — add a thin stream of water or more lemon juice to thin it out. I like my hummus very thick, and the zucchini adds liquid, so I only added a few tablespoons of water as I went along. 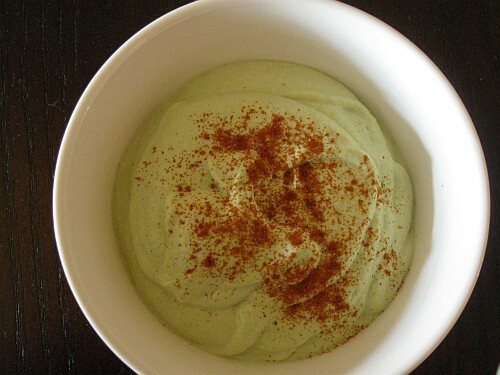 What’s a better way to pack nutrition into your lunch than to infuse your hummus with green power? This is a great way to get kids to eat their broccoli (or, if you’re a broccoli fanatic like Caroline, to find ways to eat more of the stuff). And it’s also just a darn tasty recipe, which I think you’ll all love. 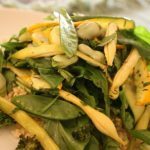 It’s great on its own, but I’ve already enjoyed it in raw wraps and scooped atop salads, as pictured in this post. So next time you whip up a batch of chickpea crack hummus, keep this variety in mind. Your body will thank you for the boost of calcium and protien, and your palate will thank you, period. Before I go, a note to people who use Google Reader: last night, a few of you let me know that my posts were just showing up as blurbs. This was not intentional–I was fiddling with some techie stuff for the blog and changed it by accident–so no need to, um, freak out at me, as a few of you did! My settings are back to normal, and my posts should show up in full next time. Broccoli is probably my favorite veggie. I can’t go a day without it! Great recipe; I’ll definitely be trying it out! I’m actually not the biggest hummus fan, but loving the color in this one! I just made this right now! I was looking for a way to use up my broccoli. How perfect 🙂 And delicious! i have to admit i’m a little scared but maybe i will give it a shot. I am all over this as I really dont do well with chickpeas, despite trying, it just never works well for the ole GI tract, even with kombu. Anyway, love me some brock and love zuke, so this is perfect for me…and another way to use up random veggies…blend baby, blend! Great job, Gena! I love hummus, so I bet I would like this! My little guy has recently decided to shun green veggies so I’ve had to get more sneaky, err, creative with meal preparation. This looks like a winner! What a coincidence…I was craving some hummus yesterday and I didn’t have zucchini on hand to make your zucchini version, so I thought, why not try it with broccoli instead…and I liked it even better (I’m a huge broccoli fan)! Other than tahini and broccoli, I put some carrots in there as well for sweetness, cumin and garlic (which I love! ), dulse granules, lemon juice and nutritional yeast and I used it as a filler for my sushi rolls instead of rice….so delicious, even my carnivorous hubby loved it! I have a question about nutritional yeast (which I only recently discovered and I absolutely love it and add it to everything): Do you need to store it in the fridge or not? I noticed some stores have it in the fridge and others don’t. HUUUUGE hummus fan here! 🙂 Great recipe! I have got to try it out! yum! I love broccoli WITH hummus, so I bet this would be great. This is such a great idea! I woke up this am and made this, but I can’t eat raw broccoli (I know it sounds weird, but my throat gets scratchy), so I lightly steamed it first. DELICIOUS! Don’t mind if I do! This hummus is such a gorgeous color. Oh! I’ve been looking for ways to eat more raw broccoli. This is it! I have just the right amount in the fridge…Tonight, I’ll get some zucchini on the way home and whip up a batch! Yum! This looks great! 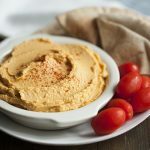 I am a serious hummus lover and always looking for new ways to make RAW hummus. Can’t wait to give this a try! Too funny! I am eating hummus right now! Divine! I’m re-instituting raw food Tuesdays in June (I’d planned on May, but turns out the first Tuesday in May was my mom’s birthday … and that meant cookies and eating out). So, I’ll keep this in mind for sure. I bet this would be the business with some flax crackers. 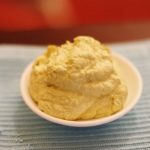 Sweet, another hummus recipe to try – thanks! So it wouldn’t be raw, but I might blanch the broccoli before I try making this. I love steamed broccoli so much! I also love Caroline…and hummus! Duh. Hope your week is going well, G.
Ahh I love finding new ways to add more brocolli and veggies to my plate! 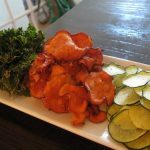 I’ll be picking up a zuchini soon to mix in with my broccoli, thanks for the recipe! Wow, thanks so much for the recipe! You KNOW I am trying this one, pronto! Congratulations – you win. I have seen enough tweets of this post within the last 24 hours to be successfully convinced that I must try this recipe. STAT. I will be purchasing nutritional yeast shortly and will have broccoli hummus in my stomach by the end of this week. When I make this I am going to substitute hemp seed butter for the tahini (since tahini is a high oxalate food). I’m really looking forward to trying it! oh gena…my fellow hummus fiend…thank you for yet another great recipe. however, try as i might to get on board with tahini, i just dont seem to have the same affinity for it as so many other food bloggers out there. maybe this will be the lucky recipe that changes my opinion? I’m so intrigued by this recipe! I, too, adore hummus, and this will be a great change–just happen to have both broccoli and zucchini in the fridge. Any suggestions for what I could use instead of nooch? I’m still a bit wary because of the yeast. I made this to top a salad, and it’s so, so good! Maybe it’s because I went light on the tahini, but I couldn’t get it to thicken to the right consistency. I ended up adding a couple spoonfuls of chia gel, and it turned out perfect! I’ve read that raw broccoli is hard to digest. That’s one veggetable that I normally leave for cooking. However, I do think that blending the broccoli helps the digestion proces further. What is your opinion on this? So… mustard means prepared mustard? Or powder? So good! Even my boyfriend thought so and he mostly only like meat and chips! Mine came out a little thin though! I’m new to the land of vita mix so perhaps I mixed it wrong. Delicious either way! This is so delicious, ever since I went Paleo carrots and hummus has been a staple snack for me. Nice way to mix it up. I like the classic version with chickpeas, but I had no idea that this version with broccoli can be so delicious. Excellent recipe! this recipe is fantastic! I’ve made at least half a dozen no- bean hummus recipes recently and this one is by far the best and the only one I will actually make again. Thank you for this wonderful recipe!